As principal trombone of the National Symphonic Orchestra, Carlos is considered one of the most renowned trombonists in Argentina. He has been featured as a soloist with the major national orchestras, such as National Symphonic Orchestra of Argentina, the Symphonic Orchestra of Bahía Blanca, the Municipal Symphonic Orchestra of Mar de Plata, the Symphonic Orchestra of the University of San Juan, the University of Tucumán Orchestra, and the Chamber Orchestra of La Plata , among others. He performs as guest artist often with the Camerata Bariloche, and during the 2002-2003 seasons, was invited to perform with the Symphonic Orchestra of the State of Sao Paolo, (Brazil). He is currently on the faculty of the Municipal Conservatory of Music of Buenos Aires “Manuel de Falla” and the Chascomús School Orchestra. 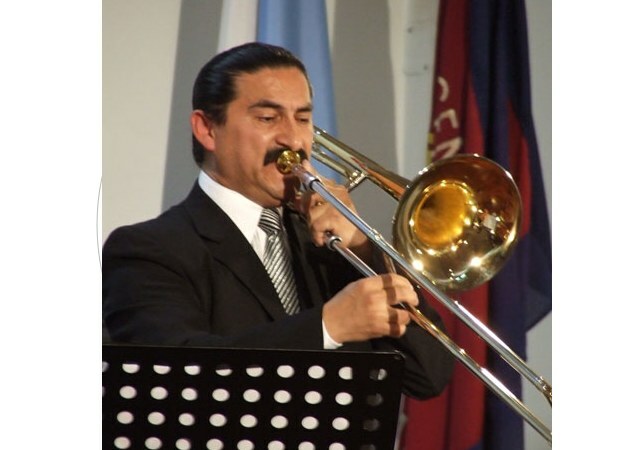 He held the position of full time Joint Professor of Trombone at the National University of San Juan, and has also taught at the Superior Institute of Art and Communication of La Rioja, as well as a member of the faculty of the “Trombonanza” international festival. Carlos studied trombone at the National University of Tucumán, where his principal teacher was Professor Giorgio Voltolina, later completing his studies with Professor Branimir Slokar in Germany.